UPDATE: Giveaway is now over! 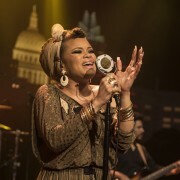 Austin City Limits will be taping a performance by ANDRA DAY on Sunday, June 12th, at 8 pm at ACL Live at The Moody Theater (310 W. 2nd Street, Willie Nelson Blvd). We will be giving away a limited number of space available passes to this taping. Enter your name and email address on the below form by 9 am on Tuesday, June 7th. Winners will be chosen at random and a photo ID will be required to pickup tickets. Winners will be notified by email. Passes are not transferable and cannot be sold. Standing may be required. No photography, recording or cell phone use in the studio. No cameras or recording devices allowed in venue.